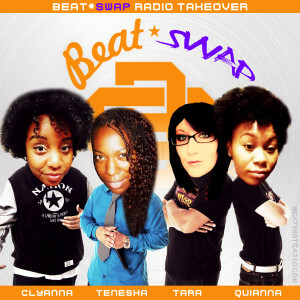 ★BEAT*SWAP EDITION! : The Beat*Shot brood gets kicked to the curb this week, as four fabulous femmes take their place. This week’s hosts are: Clyanna, Tara, Tenesha, and Quianna! ★Trope Busters: We discuss the recent reboot of Ghostbusters and why we need more women led movies that objectify Chris Hemsworth. ★Dirty DNCing: A debriefing of last week’s democratic national convention. Plus we reveal who’s ‪#‎WithHer‬ and who’s ‪#‎OverHer‬, and why. ★Curly Kale and Afros: Clyanna gives a reportback from her week long sabbatical at Soul Fire Farm, known as The Black And Latinx Farmers Immersion. ★Mama Mia: We discuss the highs, lows, and really lows of being a new Mother with Quianna and Tara, and the pressures of being a perfect mom 24/7. ★Bae-sic instinct: According to a recent study, it takes women just 3 minutes to make their mind up about pursuing a relationship with a suitor. We discuss if that’s true and if we had a moment when we realized bae would be bae. ★DIBS! : In preparation for the Garage Band Series Hip Hop Clothing Swap on August 19th at the Albany Public Library, tweet us some pieces you plan to bring to the show to trade, and we will try to call dibs on all the good stuff (use ‪#‎HipHopSwap‬).